NEWS!! 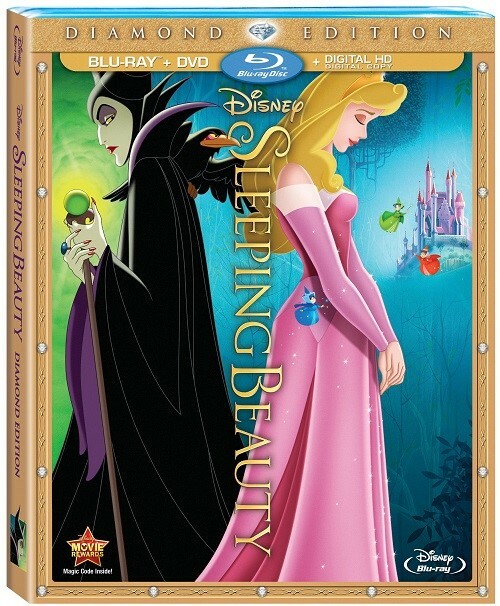 On October 7th, 2014 Sleeping Beauty is coming to DVD and Blu-Ray as a Disney Diamond Edition! Ever since I was little this movie has been one of my favorite princess movies. I have yet to find a Disney villain as epic as Maleficent. She is an Ultimate Bad girl. And of course, who could forget the fun fairies. They are so obsessed with a certain color that their hiding place is exposed. The Fair (With Deleted Character – The Vulture) – In this version of the story, the fairies do not take the Princess to live with them in the forest. Convinced that King Stefan’s order to burn all the spinning wheels in the kingdom will not prevent Maleficent’s curse, the good fairies put a magic circle around the castle and cast a spell: “No evil thing that walks or flies or creeps or crawls can ever pass these castle walls.